Earn $13.24 in Rewards credit (1324 points) What's This? ENVE takes quality componentry to the next level, and their Carbon Road Stem is yet another example of the fantastic results that stem from passionate and scrupulous design. 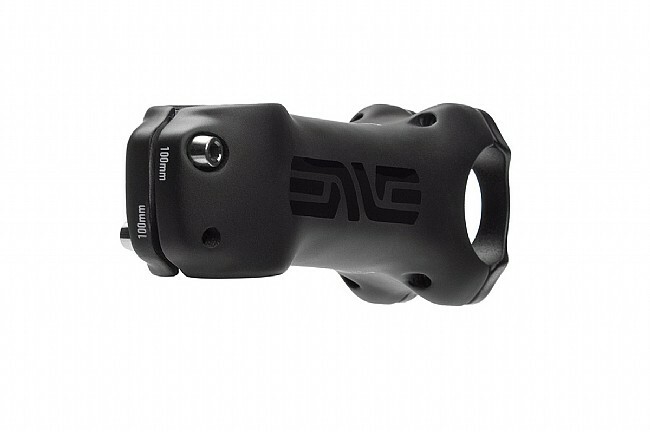 With its sleek unidirectional carbon body, this stem is torsionally and laterally stiff for optimum response yet the specific layup allows for vibration damping over rough roads to minimize fatigue. A cold-forged alloy face plate allows for excellent grip on the bars, and it bolts in with titanium hardware to bring the total weight to 115 g for 100 mm length stem. 31.8 mm clamp diameter. ±6° rise. 41 mm stack height. Enve stems are my favorite! I bought one for a bike a while back and have since, put them on all of my bikes. Beautiful stem with amazing stiffness. The stem installs without issue, performs and looks great. Only gripes is that it's a little pricey and the matt finish scratches easily. Upgraded the cockpit on my Parlee Z5 with Enve stem and Enve seatpost. (previously using aluminum Syntace and Thompson, respectively). Night and day difference, so much more comfortable. Now I have seamlessly blended Enve SES 3.4 wheelset, with Enve fork and Enve cockpit. Really solid, legit handling! Bravo Enve - you guys are dope! Bought this and the matching compact bar to complete the cockpit upgrade. Nice, beefy stem and low key with the stealth logos. Replaced my S-Works SL stem 100mm with the 90mm from Enve. I rode a few times, 50 miles and had no issue with the vibration effects (arms feel ok post ride). The cockpit seems to be stable on roughs and descent. I will participate in an event this week which will go over a century, will see. Great stem, well made, stiffnesscomformat is always subjective but combined with their compact bar it is clearly more enjoybale than a Alu barstem combo. 3 of 6 customers found this review helpful. All of the ENVE gear I have ordered is top-notch and beautiful design.